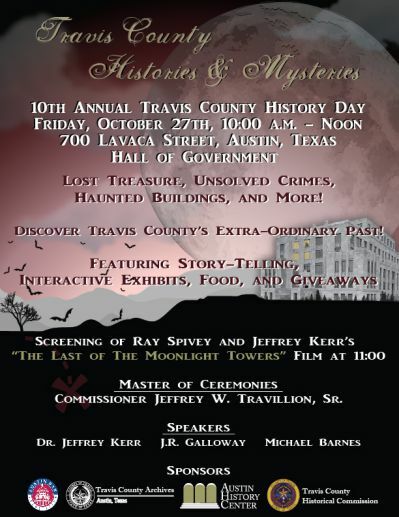 Travis County History Day is an annual event that celebrates the rich history of Travis County. Events are open to the public. Past events have focused on such topics as Mexican land grants, The Travis County Sheriff’s Department and the Travis County Cooperative Extension. The links below give an overview of each year’s event and some of the highlights. Thank you to those who were able to attend Travis County History Day 2018! Our event was a success and we appreciate everyone who was able to help us with the event. Thanks go out to our speakers, County Judge Sarah Eckhardt, and Ben Wright, Assistant Director for Communication at the Briscoe Center for American History. We would also like to thank our partners: the Austin History Center, the Travis County Historical Commission, the Military Forces Museum, Save Austin’s Cemeteries, Daughters of the American Revolution, the League of Women Voters, artist Glenn Towery, and author David Bowles. Thank you to our sponsors: the Travis County Archives, the Travis County Historical Commission, the Austin History Center, and the Austin Bar Association. For a video of the event, follow this link to Travis County’s youtube video. The 11th Annual Travis County History Day was titled, “A Catalyst for Change: The Impact and Effect of World War I on Travis County”. The event was held from 10am to noon, on November 2nd, 2018. 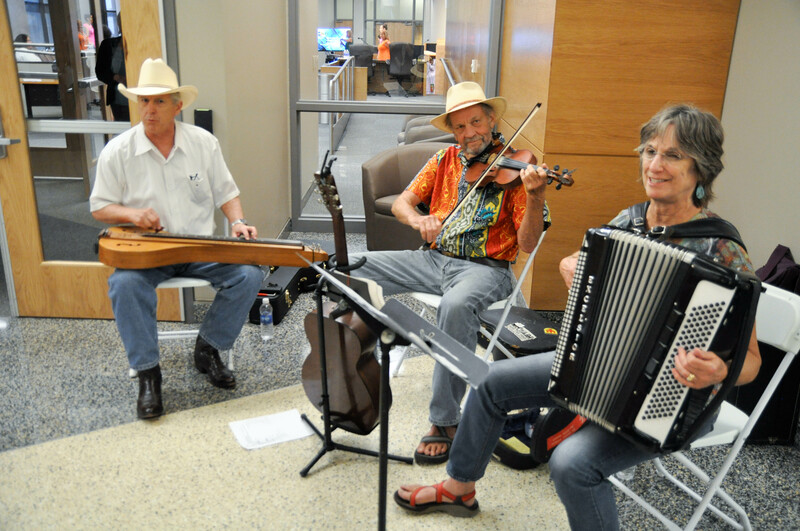 On June 24, 2008, Travis County celebrated its first annual Travis County History Day. 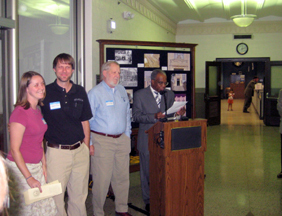 Held in the second floor lobby of the historical Heman Marion Sweatt Travis County Courthouse, the celebration featured a proclamation, several guest speakers, historical displays, and the unveiling of an informational brochure detailing the rich history of the Travis County Courthouse and the landmark court case Sweatt v. Painter. The event was sponsored by the Travis County Commissioners Court, the Travis County Historical Commission, the Austin Bar Association, and the Austin Black Lawyers Association. County Judge Samuel T. Biscoe, with members of the Page family, welcomes guests to the first annual Travis County History Day. Amalia Rodriguez-Mendoza, Travis County District Clerk, introduces the guest speakers. Dr. David B. Gracy II, Governor Bill Daniel Professor in Archival Enterprise, speaks to the crowd. 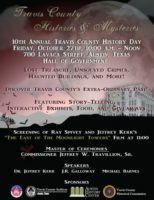 The second annual Travis County History Day was held on Friday, August 7, 2009, in honor of our county’s namesake, William Barret Travis, who was born on August 9, 1809, and to commemmorate the establishment and formation of Travis County. 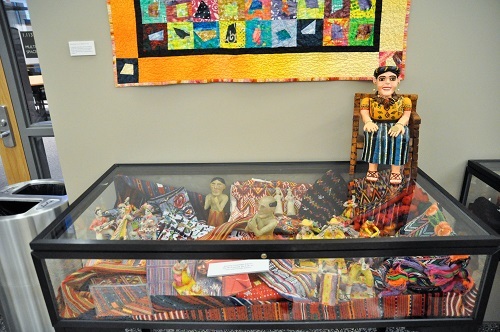 The celebration was held from 11:00 am to 1:00 pm on the second floor of the Heman Marion Sweatt Travis County Courthouse. The event featured several speakers, video presentations, historical displays and exhibits, and the unveiling of a new informative brochure. We’d like to give a special thanks to our speakers: former District Attorney Ronnie Earle, noted author and historian Dr. Archie McDonald, and Director of the Texas State Library and Archives Commission Peggy D. Rudd. Thank you also to those who sponsored this year’s event, including the Travis County Historical Commission and the Austin Bar Association. The third annual Travis County History Day was held on October 15, 2010, on the topic of Mexican land grants and the settlement of Travis County. The event was a great success, and featured a special presentation by Dr. Frank de la Teja, Professor and Chairman of the Department of History at Texas State University and former Texas State Historian. 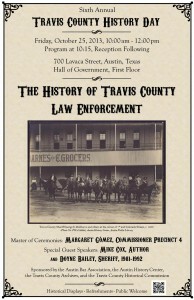 A new educational brochure on the topic was unveiled, and a variety of historical documents and archival records were placed on display, including early maps of Travis County, Mexican land grants and related materials from the Texas General Land Office, early Travis County deed and survey records, and biographies of notable settlers in the Travis County area. 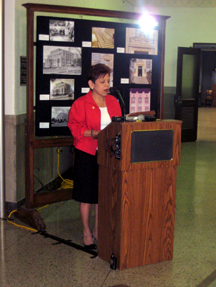 Many thanks to Dr. de la Teja; to Commissioner Margaret Gomez, who served as the Master of Ceremonies; to Galen Greaser and the Texas General Land Office Archives for their assistance with exhibits; and to the Austin Bar Association and the Travis County Historical Commission for their sponsorship of the event. 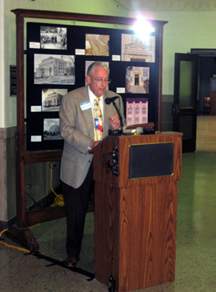 The fourth annual Travis County History Day was held on Friday, October 21, 2011. The event was in celebration of all past and present county elected officials, who are an important part of our county’s history. The event was held at 700 Lavaca, in the future site of the Commissioners Courtroom. It was very well attended, and featured special speakers and exhibits of historical photographs and documents. County Judge Sam Biscoe served as the Master of Ceremonies, and special presentations were given by Dwayne Holman, formerly of the Texas Association of Counties, and Judge Bob Perkins. Judge Perkins, the second longest-serving judge in Travis County history, has served a combined 36 years as a Justice of the Peace, County Court at Law Judge, and District Court Judge. Mr. Holman and Judge Perkins spoke on the history, development and importance of county government in Texas and in Travis County. 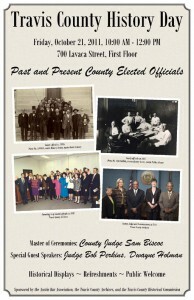 Nearly 300 photographs of current and former county elected officials were on display at the History Day event. 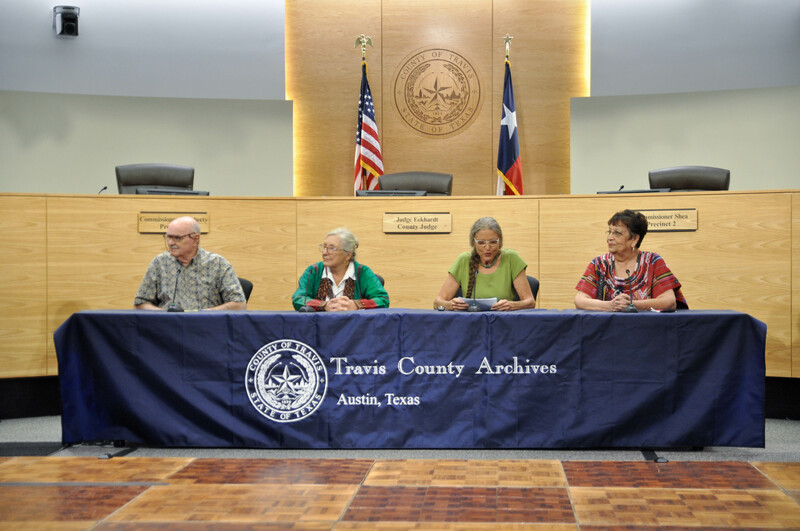 The Travis County History Day committee sincerely thanks the current and former officials and family members who helped us in gathering so many images. Most of the images are now also part of the Travis County Archives collections, and we welcome any further additions of photographs and images of current and former elected officials to the Archives. Also on display at the event were some of our counties earliest election records, campaign memorabilia, short histories of each elected office, and the names of all individuals who have served in those offices. 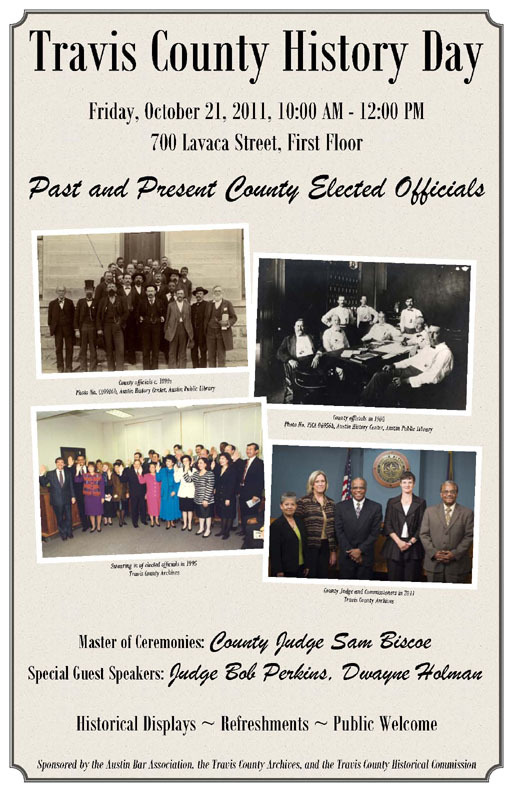 Nearly 1,000 individuals have served as elected officials in Travis County history. History Day was a great success, and many current and former elected officials were in attendance, including F.W. “Joe” Horton, the last County Superintendent of Public Instruction, and Rubert Ceder, a former Commissioner who served in the 1960s. We are grateful for everyone who came out to celebrate History Day with us! Special thanks also go out to the sponsors of Travis County History Day: the Austin Bar Association, the Travis County Archives, and the Travis County Historical Association. The support of these organizations has been instrumental in the success of the History Day event. 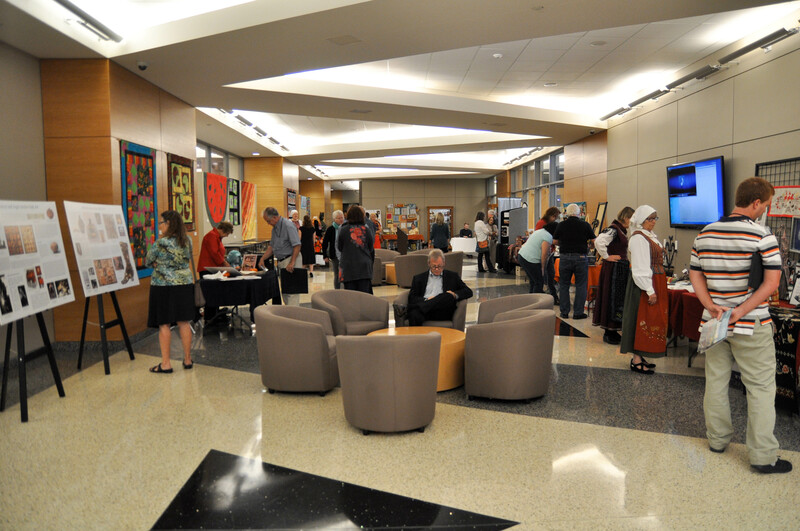 The fifth annual Travis County History Day was a success! Thanks to all of you who were able to make it to the event. 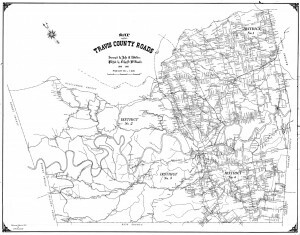 Held on October 26, 2012, the event celebrated Travis County: Then and Now, by looking at the ways the county has changed over its history. The event took place at 700 Lavaca in the Commissioners Courtroom, with historical displays presented in the Hall of Government. History Day was preceded by a building dedication for 700 Lavaca led by Judge Samuel T. Biscoe, with remarks by Commissioners Margaret Gómez and Karen Huber. We would like to thank Commissioner Margaret Gómez for acting as the Master of Ceremonies for History Day and our two speakers, R.G. Ratcliffe and Dr. Jeffrey S. Kerr. Both Mr. Ratcliffe and Dr. Kerr presented riveting stories of early Travis County history. We thank everyone who came out to celebrate our 6th annual Travis County History Day! 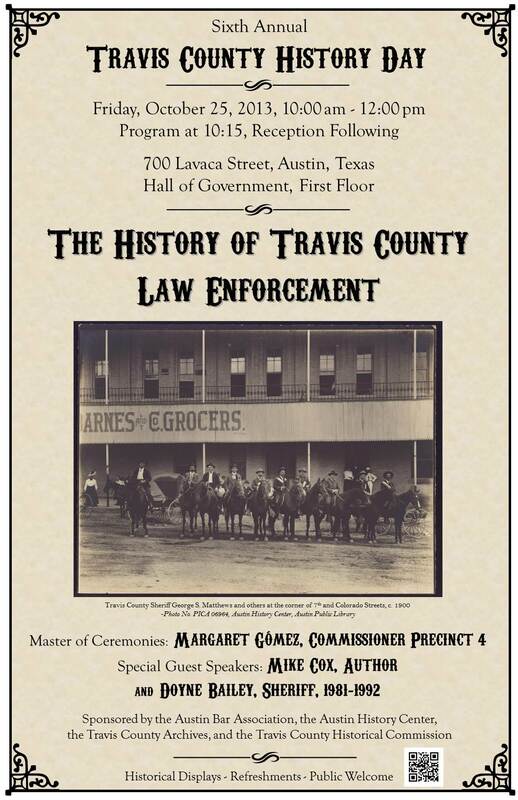 Held on October 25, the event focused on the topic of Travis County law enforcement history and was a great success! The program was emceed by Commissioner Margaret Gómez and featured special speakers Doyne Bailey, Sheriff of Travis County from 1981-1992, and Mike Cox, historian and award-winning author, who shared stories and their personal experiences with law enforcement in Travis County. 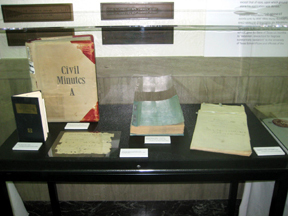 Exhibits in the Hall of Government featured a variety of display boards, photographs, and artifacts, including uniforms, patches, and badges from the Sheriff and Constable offices, contraband items from the Travis County Jail, motorcycles, and even a 1930s Tommy Gun from the Sheriff’s Office. Video displays included a virtual tour of the old Travis County Jail on top of the Courthouse, photographs, and video of blues musician Freddie King playing in the Jail in 1976. Travis County History Day was generously sponsored by the Austin Bar Association, the Austin History Center, the Travis County Archives, and the Travis County Historical Commission. We sincerely thank these sponsors for their commitment to helping put on a successful event year after year. We also thank the Travis County Sheriff and Constable Offices, former Travis County Sheriffs, and the Sheriffs Association of Texas, who contributed items to the exhibits. Special thanks is extended to Chief Deputy Jim Sylvester, who has completed an extensive amount of research on the history of the Sheriff’s Office and was an invaluable contributor and resource in gathering much of information, photographs and artifacts on display. Please visit our FlickR album to view photos of the event, and like our Facebook page to keep informed of future events! The 7th annual History Day was in celebration of 100 years of Extension Services in Travis County. Held on October 24, 2014, we thank everyone who joined us in learning about and celebrating these valuable services that have touched the lives of so many in our community. Remembering Our Rural RootsTravis County today hardly resembles the small community on the edge of the frontier it once was. Established in 1840, the county’s population at the time was mere 856 residents. This number grew rapidly in those early decades, and although the population of the city of Austin grew faster than the county, most residents lived in small communities outside the city. By 1890, Travis County’s population had grown to approximately 36,000 residents, less than half of which lived within the city of Austin. 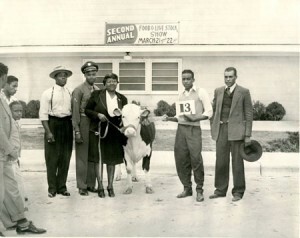 Even though Austin’s population continued to grow, by the turn of the century the majority of the county’s residents still lived on farms or in smaller towns, and agriculture dominated the area economy. Such rural and agricultural-based communities were in mind when Congress approved the Smith-Lever Act in 1914, a federal law that established a nationwide cooperative extension service and provided for state-based agricultural services to benefit farms and communities. 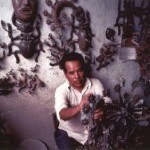 Extension services were essential in educating citizens and teaching skills in a variety of disciplines, to improve and enhance the quality of their lives. 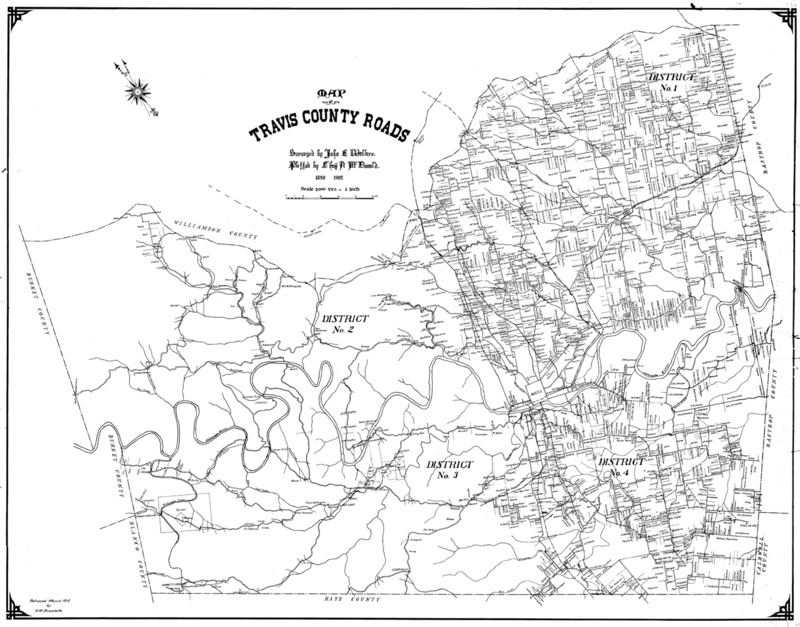 Even as the population within Austin surpassed the number of residents living in the county’s outlying communities, and as Travis County gradually transformed from a rural community to an urban one, extension services played an important role in the development and betterment of Travis County and its residents. With programs such as 4-H, horticulture, agriculture and natural resources, family and consumer sciences, residents had access to valuable information and resources that helped improve lives. 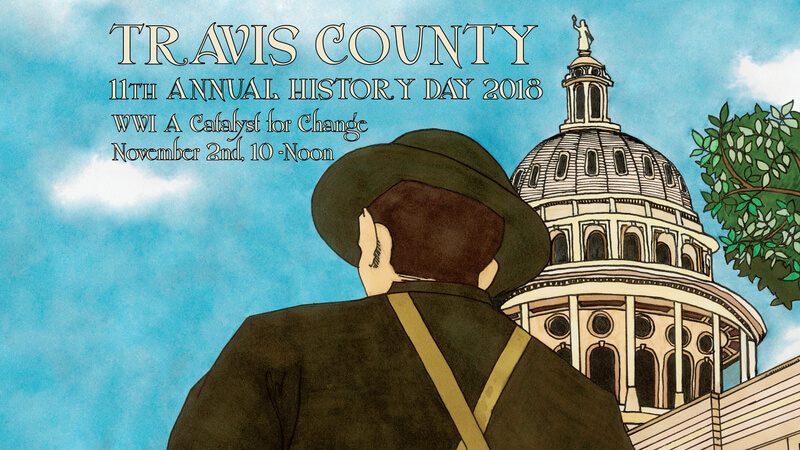 Travis County History Day 2016 was held on Friday, October 28, 2016 at 10am in the Hall of Government at 700 Lavaca, Austin, TX, 78701. The theme was on Travis County alumni, celebrating the work and legacy of previous Travis County employees. For a recap of the event, please read this blog post. Thank you to those who were able to make it to Travis County History Day 2017! This was our 10th annual history day and was a success! You can also check our Facebook page for future updates on history day. A flyer for the event is below.